Even as the global supply of natural gas surges — lowering the cost but also the margins for organizations across the industry — production shows no signs of decelerating. Countries with abundant reserves stand poised to raise their output, hoping to satisfy an increasing worldwide appetite for cleaner energy. But major questions persist about the ability of emerging markets to absorb this expected surge in supply, given challenges that include the lack of terminals, pipelines and other infrastructure. Producers and traders are increasingly stepping in, helping to finance and build onshore infrastructure or floating terminals that bring natural gas to international markets where funding for such projects may be lacking. The market continues to evolve as dominant producers such as Qatar stoke production. On the import side, China is expected to maintain an increasing appetite for natural gas as a power generation source, and opportunities are blooming in Latin America as Mexico and other countries continue investing in infrastructure and working to unlock natural gas’s full potential as a cleaner fuel. Many in the industry believe few countries stand to benefit more than the United States, which is broadly viewed as perhaps having reshaped the global market for liquefied natural gas (LNG). After decades as a net importer of gas, the United States is now the world’s largest producer of natural gas, with much of that output consumed domestically. Yet, continued advances in production technology are allowing U.S. producers to set the table toward supplying more of the world. According to the Energy Information Administration (EIA), the U.S. Department of Energy’s statistical and research arm, the United States is projected in 2017 to export more natural gas than it brings in on a net basis for the first time in nearly six decades. EIA expects that shift to continue throughout next year and beyond, given growing demand from Mexico for the fuel, declining pipeline imports from Canada and increased LNG exports. As a nod to potential U.S. global influence in the sector, roughly 80 percent of survey respondents to the 2017 Strategic Directions: Natural Gas Industry Report noted that United States emergence as a major LNG supplier is either extremely or somewhat likely to shape the global LNG market over the next half decade (Figure 23). More than 75 percent cited the emergence of new LNG markets in developing countries as extremely or somewhat likely to shape the world LNG market during that stretch. Optimism about the United States’ stature in the LNG space is being driven by the fuel’s low production costs and a profound shift in contracting practices — the latter amounting to a price restructuring that now challenges LNG’s long-standing overseas suppliers. For example, India — which previously signed a 20-year deal in 2009 for LNG from ExxonMobil — has renegotiated the terms after its rate for LNG far exceeded spot market pricing. India in recent years also has reworked its contract with Qatar, the world’s dominant LNG exporter. Higher expectations of U.S. relevance in the LNG sector come at a time of a global oversupply. Qatar removed its decade-long moratorium on the North Field development in July, setting the stage to potentially increase LNG output to 100 million metric tons per annum (mtpa), up from the current 77 mtpa. But Black & Veatch report respondents believe that glut will dwindle, making the case for new, bigger exporters such as the United States. When asked when the current LNG oversupply will abate and foster a need for a restocking in that sector, more than 60 percent of the respondents estimated that would come by 2025. Within the next five years, the survey showed, increased appetite for LNG is expected to come from south of the U.S. border. Thirty-six percent of respondents expected Mexico to up its demand for LNG over that span — an expectation underscored by the EIA, which in August said Mexico’s national energy ministry expects to increase its natural gas use for electrical power generation by nearly 50 percent between last year and 2020. Natural gas exports to Mexico from the United States reached near-record levels over the first five months of 2017, the EIA noted in August. This year’s report survey also showed that increased Latin American demand for LNG over the next half decade would come from Brazil, Central America, Argentina, Colombia and the Caribbean. Additionally, other overseas markets continue to surface; Lithuania, for instance, received its first U.S. natural gas shipment in August, marking a potential geopolitical shift in a European market predominantly supplied by Russia. Poland got its first LNG delivery from the United States just two months earlier. China’s thirst for LNG has been undeniable. Over the first seven months of 2017, the EIA noted in September, imports of the fuel spiked by 45 percent over the same period of the previous year. Aside from a slight decline in 2015, China’s imports of LNG have steadily grown over the past decade, including a 33 percent surge between 2015 and 2016. EIA projects that in 2018 China will overtake South Korea as the world’s secondbiggest LNG importer. Although Cheniere Energy’s Sabine Pass is the only continental U.S. facility for LNG exports currently in operation, a handful of other such domestic projects are in the works or nearing completion. These liquefaction capacity expanding efforts will drive total export capacity from 1.4 Bcf/d to 9.5 billion Bcf/d by 2020. At that point, based on construction plans, EIA forecasts that the United States will trail only Qatar and Australia in LNG export capacity. Such investment expectation is reflected in the industry, where 42 percent of respondents to our survey rated LNG liquefaction as one of the most critical infrastructure investments for growth in the natural gas domain. That is second only to pipeline capacity, at 72 percent. Although new markets for LNG are expected to grow, the adequacy of terminals, pipelines, power generation and other infrastructure to not only receive but then distribute and use gas, remains a challenge in many developing countries. Given the scale of these projects, it spawns financing questions about the extent public, private or a combination of these investments will pay for such upgrades. Lower-cost alternatives have surfaced, including ships able to receive LNG and convert it back into conventional natural gas as well as economical configuration of gas-fired generation infrastructure. 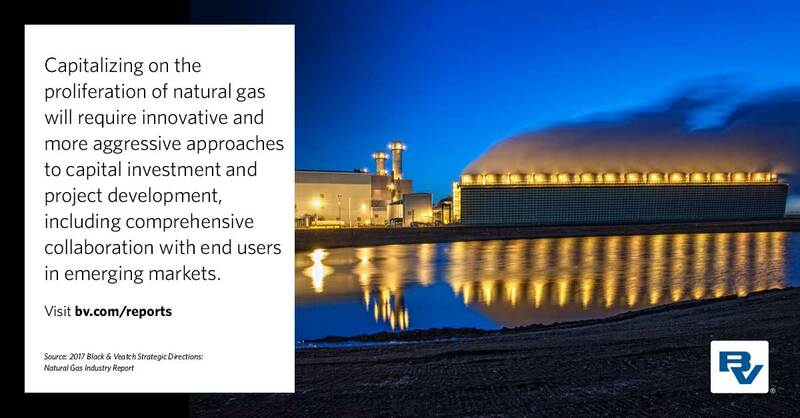 Capitalizing on the proliferation of natural gas will require innovative and more aggressive approaches to capital investment and project development, including comprehensive collaboration with end users in emerging markets. Sophisticated, diverse entities with deep engineering, commercial and political experience across multiple continents are vital for the ideal integration of natural gas and electric projects needed to optimize abundant natural gas resources, diversify energy portfolios and maximize return on investments.